The Ivan L. Preston Outstanding Contribution to Research Award honors individuals who have made sustained and systematic contributions to advertising research. Recipients are honored with $1,000 and a plaque during the annual AAA Conference. 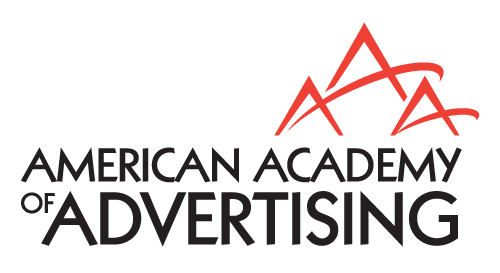 The Distinguished Service Award is given by the American Academy of Advertising to individuals who have rendered distinguished service to the organization and/or advertising education. The person should be a champion of advertising education, active in providing opportunities for the professional development of students and faculty and someone who unselfishly performs this meritorious service. One need not be a member of the AAA to be considered for this award. The Billy I. Ross Advertising Education Award is to recognize innovative work that advances the field of advertising education. It is given to people who have completed projects or other innovative efforts in teaching. Examples of projects might include: innovations for teaching a new advertising course, published work about innovative class projects in advertising, published research that advances advertising education, support materials (such as visual aids) for conference presentations about advertising education, and dissemination of information to advertising educators that is helpful in the classroom. The Kim Rotzoll Award for Advertising Ethics and Social Responsibility was established in 2004 and recognizes individuals or organizations who have demonstrated an outstanding commitment to advertising ethics and social responsibility. There must be evidence of lifetime achievement in either ethics or social responsibility. For an academic, such evidence may be in the form of scholarly publications and for an advertising practitioner or organization the results of specific programs or activities that have had a positive impact on society would serve as evidence. The Charles H. Sandage Excellence in Teaching Award recognizes outstanding contributions to advertising teaching. Examples of excellence might include: performance of students as advertising (or business) professionals, performance of students as advertising (or other) teachers, case study development and publication, textbook publication, letters from past students, innovative course development, and innovative ex-class room teaching development. The Mary Alice Shaver Promising Professor Award honors a junior faculty member who has demonstrated excellence and innovation in advertising teaching and research. The award is given to full-time faculty who have taught no more than four years and who are members of the American Academy of Advertising. The potential awardee must be nominated by a current AAA member. © Copyright 2017 American Academy of Advertising.